Subscribe to My Blog to stay up to date and receive your free PDF Guide To Pain Relief. here with VIVESCO Mobile Health & Fitness!!! So here I go again, only 3.5 weeks this time. Over to Europe again for a music festival in Belgium (cover pic), some quality time with my family and friends in Germany, followed by my husband’s barge master’s wedding in Lithuania. Very much so looking forward to all this. There will be no available sessions with Vivesco starting Wednesday the 22nd of July. First day back will be Saturday the 15th of August. Most of us live a rather stressful life. And constantly we hear how bad that is for us, which stresses us out even more. Sad fact is, it will be very very hard to eliminate the stress as that would mean you have to become a hermit and live in a cave – far away from computers and mobile phone service. – Breathe: If something out of the ordinary happens that stresses you out, take a moment and just breathe. The SPL, just like the LL, is really 2 lines, a right one and a left one. 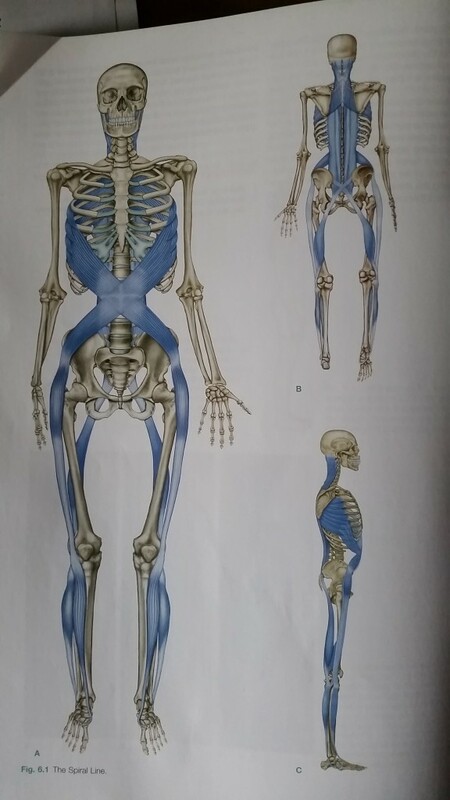 They loop around the body, connecting each side of the skull across the upper back to the opposite shoulder, follow around the rib cage to the front to cross over again at navel level traveling down towards the hip. From the hip they go down the outside of the thigh, sweeping medial just below the knee, going underneath the foot just in front of the heel, coming up on the other side of the foot to now travel up on the outside of the lower leg, sweeping medial just above the knee towards the sacrum, where it follows the track of the SBL back up into the base of the skull. 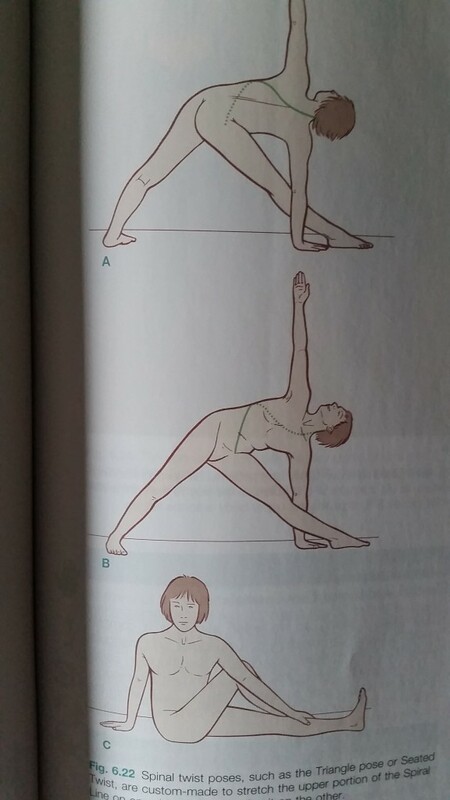 What does the Spiral Line do postural? It helps maintain balance across all planes of motion. Through the connection between the pelvic angle and the foot arches it helps with efficient knee-tracking in gait/gait patterns. The SPL is heavily connected to all lines we have learned about so far, as well as the arm lines, which we will get to next month. Because of that connection, the spiral line has a massive impact on the SBL, SFL and the LL, positively as well as negatively. Most people have a dominant hand, leg, and eye, which leads to the fact that no one is ever perfectly balanced. However, the SPL is very adaptable within it’s functionality, hence, counteracting the natural dominant-recessive interplay between left and right that we all present with. Compensation patterns that we can see are: Ankle pronation or supination, knee rotation, pelvic rotation in relation to the feet, rib rotation in relation to the pelvis, one shoulder lifted or shifted forward (anteriorly), as well as a head shift, tilt or rotation. What does the Spiral Line do in movement? The SPL creates and mediates oblique spirals and rotations in the body. It also stabilizes the trunk and the legs, which prevents those from collapsing into those rotation movements. We start at the head this time, at the side of the back of the skull between the 1)occiput and the temporal bone. It runs down the 2)capitis muscles and meets the 3)spinous processes from C6 to T5. Here the lines cross over picking up the 4)rhomboids on their way, and a smaller part goes underneath the rhomboids connecting with serratus posterior superior connecting with the ribs. Following the rhomboids to the 5)medial border of the scapula, where it connects with the infraspinatus and subscapularis (part of the arm lines and will be discussed more next month) as well as with 6)serratus anterior, explains how the left shoulder is now connected with the right side of the head, and the right shoulder connected with the left side of the head. The connection between the rhomboids and serratus anterior is very strong, and one could almost say they are one muscular complex. The more common thing we see here are long locked (eccentrically loaded) rhomboids, and the serrati locked short (concentrically loaded), which pulls the scapula away from the spine. This often shows in the kyphotic spine (round forward shoulders). The opposite is not as common, but one would see the scapula hold closely to the spine presenting with a rather flat back through the thoracic spine. The SPL now tracks along the 7)rib cage to the front through ribs 5-9. The serratus anterior here has a good fascial connection to the 8)external obliques. The fibers of the external obliques carry on medially and down to wards the 9)linea alba (midline of the trunk) where they mesh 10)with the fibers from the opposite site. Compensation here can show up as a shortage between the rib cage and the hip on one side compared to the other, with or without a rotational pattern. On the next station we have a lot of different muscles attaching pulling into all sorts of direction, the 11)anterior superior iliac spine (ASIS): Internal obliques, transversus abdominus, sartorius, illiacus, rectus femoris, tensor fasciae latae, gluteus medius, external obliques. First of all this means that any kind of imbalance can be super complex and needs patience to work it out. Second of all, in terms of the SPL, this also means that there is not always a continuity between the upper SPL and the lower SPL. Imbalances in the upper SPL does not mean they continue necessarily to the lower part and vice versa. The lower SPL can be seen as a sling that goes from the hip, underneath the foot and back to the hip. Coming out of the ASIS the SPL connects with the 12)tensor fascia latae, which then flows into the ITTB. Here we stay anteriorly this time and pass by the knee 13)into the 14)tibialis anterior on the front of the lower leg. Tibialis anterior tracks down and inwards going into the joint capsule between the 15)1st cuneiform and 1st metatarsal. From the other side into the same joint capsule then comes 16)fibularis longus. This is our connection to the other side of the foot, and creates a stirrup under the foot, just behind the arch. Following fibularis longus upwards we find ourselves on the antero-lateral aspect of the lower leg (front-side), where both, tibialis anterior and fibularis longus are right next to each other, divided by fascia. This stirrup now explains the following: In a pronated foot, tibialis anterior is often locked long (goes into the foot on the isnide, foot is flat) and fibularis longus is locked short (pulls on the outside of the foot, pushing the sole of the foot down). Obviously we see the opposite in a supinated foot. 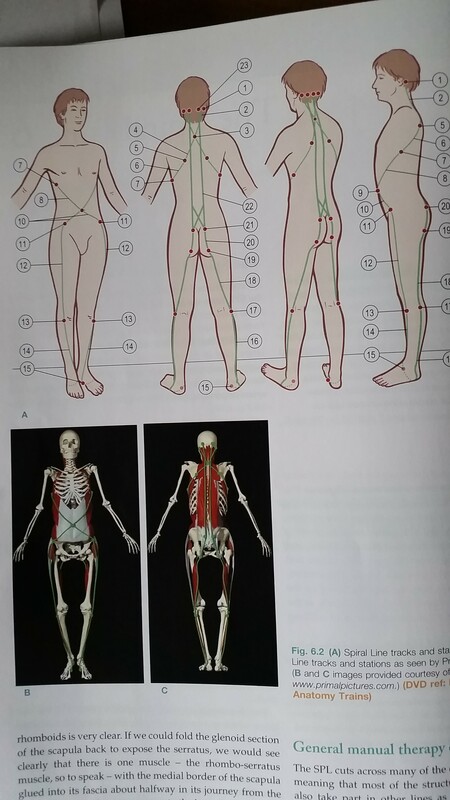 We keep going up now towards the 17)fibula and then start sweeping inwards through the hamstrings, in particular the short head of 18)biceps femoris and also adductor magnus, into the 19)ischial tuberosity (sitting bone). It is these two that are often the culprits of so called ‘tight hamstrings’, preventing proper hip flexion and hip-knee-interplay. I often find adductor magnus super tense with most of my clients. Why I do not know. From the sitting bone the SPL now follows the track of the SBL onto the 20)sacrotuberous ligament, across the 21)sacral fascia, where it crosses over again, to then follow along the 22)erector spinae, all the way back into the back of the skull connecting to the 23)occiput, just medial to where we started. If you managed to follow all this you will see how there is a constant interplay between the two sides. Through rotational and twisting motions one side will be lengthened whilst the other is shortened. See the following exercises how the twist engages both sides at the same time, eccentric and concentric. Looking at the Spiral Line, I hope, gives even more clarification why I always work opposite sites, and for example work the side of the ribs, even though you may complain of neck pain. With every month you should get a better understanding of how the body is connected, and why I approach anyone like a blank canvas at any given time. Chop everything into pieces, put all into a pot, add water bring to boil and cook down. Puree everything, enjoy!!! Check your inbox or spam folder now to confirm your email address and activate your subscription. Website maintenance by Doig Website Technology.